It is the last day of campaign for Karnataka Assembly elections 2018. It is the last day of campaign for Karnataka Assembly elections 2018. The intense campaign, led by Prime Minister Narendra Modi for the Bharatiya Janata Party (BJP) and Congress president Rahul Gandhi for the Congress, comes to an end at 5 pm on Thursday. Several big rallies and public meetings are lined up in many parts of Karnataka. 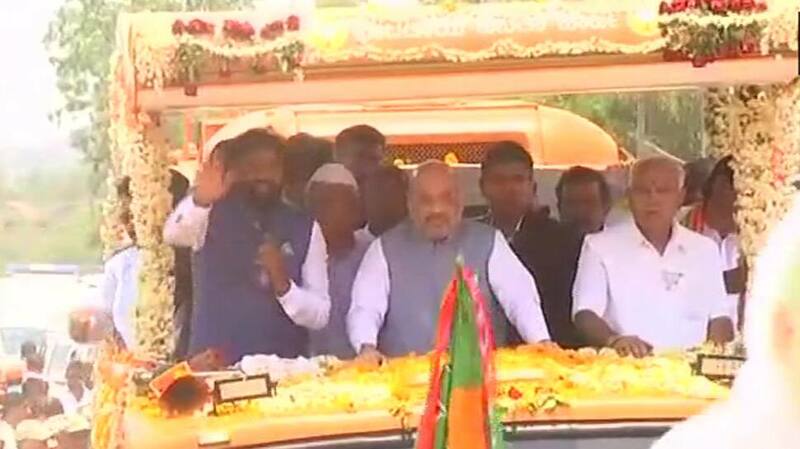 BJP chief Amit Shah and the party's chief ministerial candidate BS Yeddyurappa will hold a roadshow in Karnataka Chief Minister Siddaramaiah's Badami constituency. Congress chief Rahul Gandhi and Chief Minister Siddaramaiah will campaign for their party on the final day of campaigning. Meanwhile, regional parties, including JD-S, will also make all-out efforts to convince the voters. The idea of the government and the RSS is to crush your spirit, but we won't let that happen, says Rahul Gandhi. Congress party will win Karnataka elections hands down, it is a fight between two ideologies, says Rahul Gandhi. Congress has given tremendous support to Bengaluru, and we will continue to support the city, says Rahul Gandhi. This election is not about me or the Prime Minister, it is about the people of Karnataka, respecting what they want, says Rahul Gandhi on question on being capable of becoming the Prime Minister of the country. The Prime Minister wants to distract people of Karnataka, they are not telling what they are going to do for the people of Karnataka. This state produced the largest number of jobs in the country. I will not be distracted by the Prime Minister, we will not let him create anger, says Rahul Gandhi. NDA ministers are coming to Karnataka because they are in panic. They have realised that the Congress party is behaving differently, says Rahul Gandhi. My mother is more Indian than many Indian people I have seen. She has worked for the country. PM Modi's comments respect his level. If it makes him happy, I wish him a good day, says Rahul Gandhi. Russia is supplying arms to Pakistan, which it never did before. Our foreign policy is a disaster currently, says Rahul Gandhi. The central challenge in front of our country is to give job to youngsters. China is a competitor and a rising power. We have to manage our foreign policy with extreme care, but we are making fundamental errors, says Rahul Gandhi. The Prime Minister met Xi Jinping in China without any agenda. We had an agenda and it's called Doklam. Our foreign policy has been decimated because he uses foreign policy as an individual exercise, says Rahul Gandhi. BJP does not understand what Hindu means, it is unaware about the term Hindu, says Rahul Gandhi. Rapes of women is a political issue and it is a national issue. Does he want to say that politicians should not discuss about women security? Women security is a fundamental issue and politicians must speak about it, says Rahul Gandhi. Now Prime Minister is talking about us when he says that Congress party is raising issues related to Dalits. When Rohith Vemula died, he did not say a word, he never spoke when Dalits were flogged in Una, says Rahul Gandhi. I would not like to talk about PM candidate debate. Mr Modi likes to distract people, but I won't get into the debate, says Rahul Gandhi. I agree with PM Modi when he says Rafale deal is better under NDA, but it is better only for the Prime Minister and his friends, says Rahul Gandhi. There is no comparison between the two opponents, on one side we have honest Siddaramaiah and on the other side we have corrupt people like Yeddyurappa and Reddy brothers, says Rahul Gandhi. We have outlines our achievements, and we are fighting under Rahul Gandhi's leadership, says Siddaramaiah. There is no anti-incumbency in Karnataka, even journalists are saying the same, says Chief Minister Siddaramaiah in press conference. The Congress party campaigned on fundamental issues, the BJP resorted to personal attacks, says Rahul Gandhi in Bengaluru. The Congress party is united in Karnataka, and we are fighting the elections on real issues concerning the state, says Rahul Gandhi at a press conference in Bengaluru. "Karnataka is known to the world as India's Silicon Valley. Our Nava Karnataka Manifesto focuses on ensuring that Karnataka continues to make great strides towards IT innovations in order to emerge as a global innovation hub," tweets Karnataka Congress. "I am often told history is against me as no sitting govt in Karnataka has been re-elected in a long time. But we are here to create history & not to obey it," tweets Siddaramaiah. Karnataka Congress tweets, "Karnataka Govt promoted good business practices & provided Start-Up friendly policies. The valuation of Start-ups in Bengaluru alone stands at $19 Bil. To further promote innovation, we put in place 'Elevate 100' which funded & mentored 132 Start-ups." Some people are trying to create a divide among people on the basis of caste, says PM Modi. The BJP has maximum number of SC and ST members of Parliament, says PM Modi. Prime Minister Narendra Modi addresses SC, ST and OBC workers of the Bharatiya Janata Party in Karnataka. BJP Karnataka tweets: As we enter the last day of public campaign, the BJP is organising road shows in more than 150 assembly constituencies today attended by our central leaders and CM's of various states. Our workers are reaching millions of voters at their homes & heralding a new Karnataka.